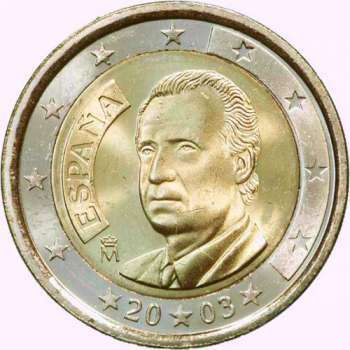 Obverse : Twelve stars (4 of them incuse) surround the portrait of King Juan Carlos I, ESPAÑA incuse at left and Crowned M below, (date) below between stars. Reverse : 2 on the left-hand side, six straight lines run vertically between the lower and upper right-hand side of the face, 12 stars are superimposed on these lines, one just before the two ends of each line, superimposed on the mid - and upper section of these lines; the European continent is represented on the right-hand side of the face; the right-hand part of the representation is superimposed on the mid-section of the lines; the word EURO is superimposed horizontally across the middle of the right-hand side of the face. 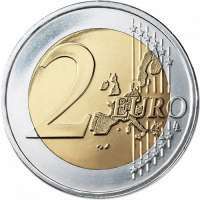 Under the O of EURO, the initials LL of the engraver appear near the right-hand edge of the coin.